The Lisson Gallery has a formidable reputation for showing ‘good art’, intelligent, accessible and visually rewarding representing Marina Abramovic, Anish Kapoor and Tony Cragg. Their latest show Surface/Tension is a three person show exploring the artists’ use of materials and their individual approaches to them. For Surface/Tension, Dan Shaw-Town treads a fine line between painting and sculpture, Kitty Kraus experiments with glass and Gedi Sibony works with everyday found materials. Having worked separately the artists work with their chosen materials both visually and conceptually. Dazed Digital: What is the premise behind Surface/Tension? Dan Shaw-Town: I believe the premise was to select a group of artists whose practice at least in part involves transforming their selected materials. This might be pushing something to near breaking point, or re-locating an otherwise arbritary material in a new space, in each case often treating the chosen material in an unfamiliar manner. Therefore the process may differ but there appears to be a shared goal, a goal that I think has more to do with 'potential' than anything else. DD: You often work and re-work your pieces how did this working process come about? 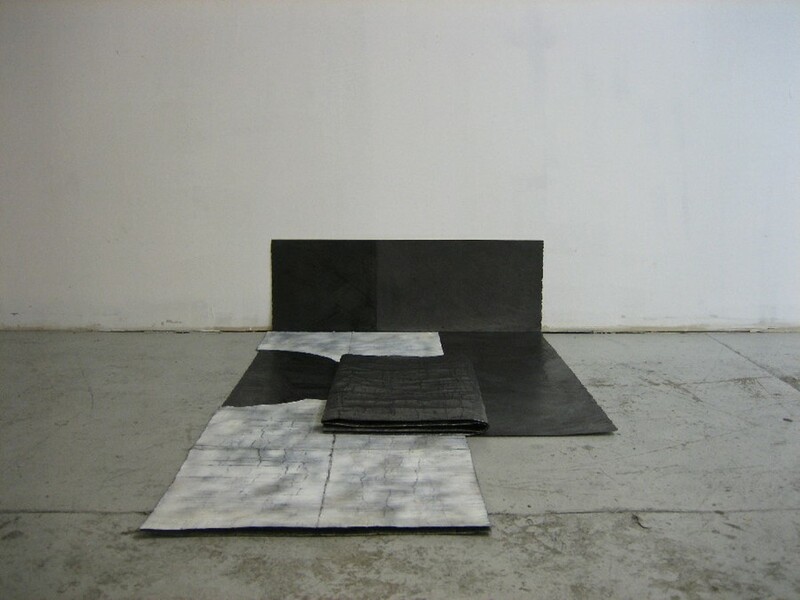 Dan Shaw-Town: A large part of my practice is concerned with creating a 'surface'. A physical and repetitive process of mark making, an entropic cycle of creating whilst, at the same time, erasing and ultimately changing. Once a new surface is made I always want to disrupt it again in some way, but this can lead to making a work with too much going on (visually). So then I have to back track. Most of the works went through a series of transformations before settling on their final appearance. DD: Does this hold meaning (the re-working of your work) or is it purely for visual affect? Dan Shaw-Town: I wouldn't say the 're-working' aspect holds any specific meaning nor is it intended to act as a visual affect, it's just part of my process, it's the way I make work. DD: Why do you term your work sculpture? Dan Shaw-Town: I have constant conversations with myself in the studio about whether I make drawing or sculpture, occasionally I even try to convince myself I make paintings but that doesn't last long. The argument for sculpture is strong : I work 'with' rather than 'on' paper, I render the surface which leaves behind marks as document of that process. I then roll, bend and crumple the sheets to give them form, before pressing them flat and hanging them on the wall using grommets, therefore displaying the method without illusion (as in frame etc). Occasionally I even fold works and display them on the floor. There is no doubt in these cases. DD: Surface/Tension is a group show. Was the process in any way collaborative? Dan Shaw-Town: No the show wasn't collaborative, the 3 artists were selected by Alex Logsdail (Associate Director The Lisson Gallery). I have worked with Alex before and he knows my practice well and I was already familiar with the work of Gedi and Kitty, so I had full confidence that I was in good hands and good company.